As South Africa’s government loosens its grip on regulations and seeks to become more investor friendly, junior miners look set to capitalise on what has been described as a new dawn of mining. 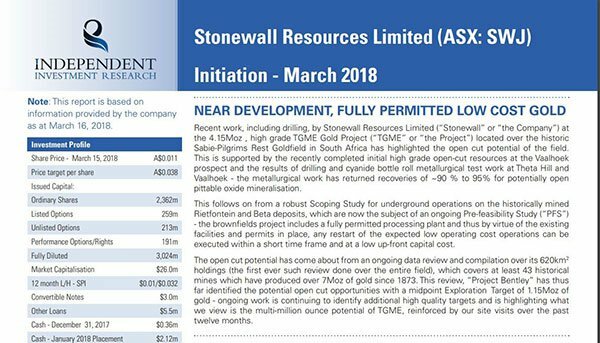 One such company, ASX gold junior Stonewall Resources (ASX:SWJ) is well positioned to take full advantage of these upcoming changes. SWJ is in the process of reawakening the giant goldfield in South Africa’s Eastern Goldfields, where South Africa’s gold mining industry began almost 130 years ago. SWJ currently has access to over 43 historical mines, spanning 62,000 hectares that contain around 35 million tonnes of pre-explored, pre-developed, pre-drilled and pre-blasted gold-bearing ore left over from almost a century of mining. Two of SWJ’s key mines pave the path to success in 2018. Positive assay results from the Theta Hill site where the drilling contractor OMT Exploration has just begun Diamond and RC drilling ahead of open cut resource calculations, coupled with the company’s intention to begin drilling at the Rietfontein mine later this year means that 2018 is shaping up to be a strong year for SWJ. Drilling is expected to be completed in April, just weeks from now with assays due in days. 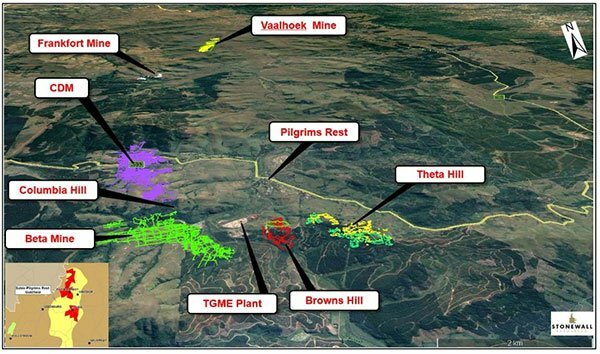 Add to this recent news of a third open-cut discovery at the historical Vaalhoek site, with a maiden high grade open-cut 17g/t gold resource (82% inferred, 18% indicated) and things look to be really heating up for SWJ. However, it should be noted here that today's junior is in its early stages and investors should seek professional financial advice if considering this stock for their portfolio. 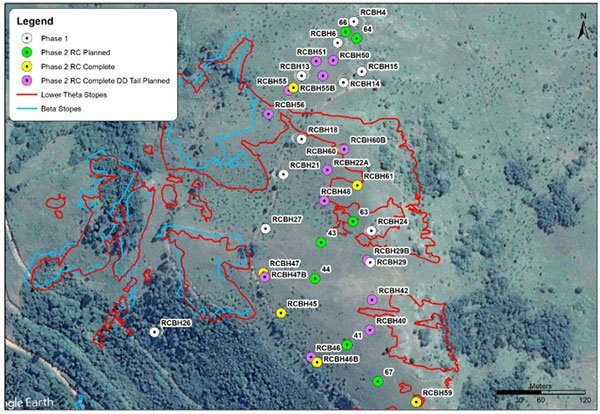 This is the third open-cut target after Theta Hill and Columbia Hill, with the resource upgrade forming part of an overall annual JORC review of the region which will be completed by the end of April – just weeks from now. Over the last two years SWJ has steadily increased its gold resources. They are now the largest they have ever been, with the company currently holding a JORC resource of 3.7 million ounces of gold at a grade of 4.34g/t. Not only that, but one of the company’s most promising projects, the Rietfontein mine contains a world-class JORC resource of 2.55Mt at a grade 11g/t for 905,000 ounces of gold. Even more promising is the fact that preliminary studies suggest this site may be developed at a potentially low cash cost of US$417/ounce and produce an impressive 60,000 ounces of gold annually. Discovering deposits of 10g/t is exceedingly rare. Rarer still the potential to extract such high-grade gold at such a low-cost. In fact, there are only around 26 gold deposits matching the Rietfontein mine’s quality in the entire world, and of those 26 only 14 are currently producing gold. Understandably, SWJ is eager to take advantage of this situation, with diamond drilling planned for the second quarter of 2018. SWJ’s growing JORC resource will also prove to be an integral part of the company’s ambitious growth plans over the next few years as it aims towards a production target of 100,000 ounces of gold per year. To facilitate this goal the company is aiming to refurbish the existing TGME processing plant at Pilgrims Rest this year. 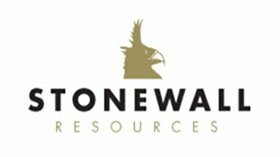 When we last updated you on Stonewall Resources (ASX:SWJ) back in January, with the article South Africa Back on the Gold Map? ASX Goldie Hits Shallow Gold Reef at the Right Time we discussed the impact of South Africa’s proposed policy changes on the country’s mining and exploration sector. While this news has yet to impact SWJ’s stock price directly, promising results from one of SWJ’s most important open cut mines, Theta Hill, sets the scene for big things to happen to this gold junior in 2018. Following the favourable results from its first round of reverse circulation (RC) drilling in December, phase two drilling at the Theta Hill site has continued to yield strong results. Since recommencing drilling in January 2018, a total of 20 out of a planned 27 holes have been drilled. Seven of which have already been drilled to complete depth. While not every hole was drilled to completion, assay results from the Lower Theta Reef, indicate a high-grade consistency of approximately 30g/t gold based on an estimated average reef thickness of 0.3m. Of the holes that were not drilled to completion, upcoming diamond drilling is now underway. This drilling will be undertaken on 13 of the remaining holes and is expected to take around four weeks to complete. Assays will be due in late March. This approach will allow SWJ to obtain a more accurate idea of reef thickness and reef locations. It should also overcome the ground issues previously encountered with RC drilling. Besides the strong drill results coming out of the Theta Hill site, SWJ has made a third open cut discovery at the historical Vaalhoek site, whilst the core management team continue to strategically allocate funds as they aim to maximise shareholder value. The Vaalhoek Project is situated approximately 20km from SWJ’s fully permitted CIL plant. Prior underground mining took place between 1910-1956, with 1.3Mt extracted at an estimated head grade of 11.7g/t and production of 473Koz. SWJ is looking to follow up on this as it continues to examine ways to expand its resource. Here’s a look at where Vaalhoek fits into the big picture. The previous JORC (2004) resource was an underground prospect, coming in at 1.35Mt at 5.74g/t gold for 248Koz (100% inferred), whilst the updated JORC (2012) underground resource was calculated at 2.68Mt at 5.3g/t gold for 457Koz. The 2018 upgrade at Vaalhoek comprised data collection, digitisation, modelling of 3D wireframes and eventual statistical estimation. This has led to a significant upgrade for the inferred and indicated Mineral Resource at the Vaalhoek Reef. SWJ does have a long way to go here, so investors should maintain a cautious approach to any investment decision made with regard to this stock. 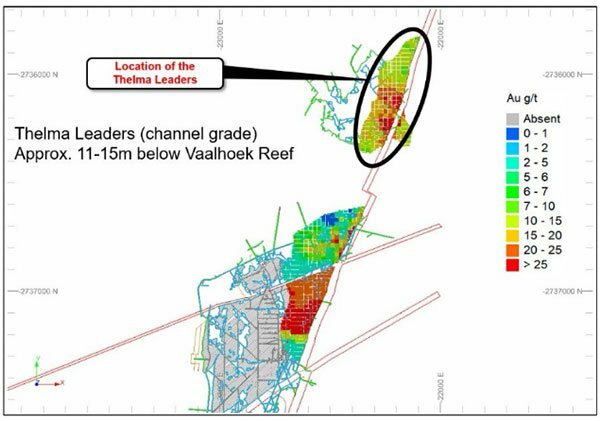 In addition, a maiden 134Koz open-cut resource at over 14g/t gold has been included from the high-grade Thelma Leaders Reef (below) which is located situated between 11m and 15m below the Vaalhoek Reef. These high gold grades could support an open-cut mine at the site, which would reduce overall development costs in comparison to an underground development in the same region. SWJ’s update on its metallurgical grab samples taken in February 2018 at Vaalhoek were also positive. The samples were recovered from old underground sections of the Vaalhoek project area, with two coming from the Vaalhoek Reef and the other two from Thelma Leaders Reef. The samples were submitted to SGS Laboratories for gold recovery estimate in a simulated CIL environment. Across the samples, head grade varied from 6.4g/t to 37g/t gold, yielding an average of 92% gold recovery (as seen below). As you can see, all looks positive for SWJ and as we alluded to above the company is also work hard on its business strategy to maximise shareholder value. While SWJ continues to focus on expansion, management has been steadily repaying the company’s convertible loans at a rate of $130,000 per month, taking its outstanding debt all the way down to $1 million. Additionally, the share purchase plan (SPP) initiated in September of last year has also contributed positively to SWJ’s current financial position – having freed up $6 million for the company to use where necessary. These proactive measures taken by management should be a particularly good sign for prospective investors as would the recent appointment of Bill Guy as a director. Mr Guy has over 25 years’ experience in exploration and resource development and as managing director of $41 million capped Longford Resources and exploration manager at the $185 million capped Jupiter Mines. With capital intensive works planned this year, including refurbishing the TGME processing plant and taking steps to move the Rietfontein and Bentley sites into development and production by 2019 – now more than ever it is important SWJ is not hampered by unnecessary debt. The goal is to resume gold production as soon as possible. To this end, SWJ has been proactive in engaging engineers to begin work on the refurbishment, upgrade and expansion of the existing TGME processing plant at Pilgrims Rest and its nearby mines. While this plant has not produced commercial quantities of gold since 2015, it remains connected to the national electricity grid. Given that the TGME processing plant is an existing piece of infrastructure, construction time should be reduced and capital expenditure minimised. While the developments discussed thus far are all important for SWJ’s growth in the coming years, it is the political news coming out of South Africa that may prove the most significant. Although this news is yet to directly affect SWJ’s share price, as the implications of this news become clearer over the coming months it is not unreasonable to expect that mining and exploration companies, including SWJ will begin to positively benefit from the changes. It does, however, remain a speculative stock and investors should seek professional financial advice if considering this stock for their portfolio. For a long time political uncertainty and a complex regulatory framework has hampered growth for South Africa’s junior mining and exploration sectors. Yet overwhelmingly positive talk of reform from South Africa’s new leader, Cyril Ramaphosa, looks set to change all this. With Goldman Sachs even describing South Africa’s mining sector as the “The best emerging market” of 2018. With such positive comments coming from South Africa’s new pro-business leader it’s no wonder that investment sentiment is becoming more optimistic. This could be the start of the long-awaited revival of the country’s junior minors and exploration sector. A new dawn in mining. What’s does this mean for SWJ going forward? Assuming gold prices remain stable and South Africa’s pro-gold and pro-mining policy promises are delivered upon, junior miners such as SWJ are in an incredibly favorable position to capitalise on these changes over the coming years. Importantly, as long as SWJ can finalise its exploration plans and move into production as scheduled, its operations have a chance to improve both quickly and dramatically. Add to this the recent Theta Hill results, the world class potential of the Rietfontein mine site and the company’s focused leadership, it means that 2018 and beyond could be a stellar year for SWJ. “Given the encouraging developments and progress and the renewed investment interest in South Africa [...] we believe now is the time to ramp-up activities to the next level oriented towards re-establishing gold production”.